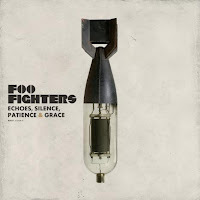 The Society of Gloves: Review: Foo Fighters "Echoes, Silence, Patience & Grace"
Review: Foo Fighters "Echoes, Silence, Patience & Grace"
What if Kurt Cobain had lived? I vaguely (or mistakenly) remember a radio broadcast on the Thursday night (April 7, 1994) before an electrician found Kurt's body. On that edition of KROQ Music News, Tami Heide broke the rumor that Kurt Cobain had fired his bandmates, thus dissolving Nirvana. That wasn't the case, sadly, as Kurt had already been dead for a couple of days. Let us journey - for a brief moment - to an alternate reality, where Kurt had not died, but lived and officially dissolved Nirvana. With Kurt being alive, Dave Grohl still would have recorded another solo album a la Late! Pocketwatch, but it probably would not have been successful. The reaction would have been, "Oh, that's just the drummer's solo album!" Pat Smear would have never joined the touring band, and neither would the rhythm section of Sunny Day Real Estate. As for Krist...well, he still would have been on the current path of saving our democracy. The band Bush would have kept their jobs as house painters, and the boys of Silverchair would have stayed in high school. With Nirvana dissolved and unable to headline Lollapalooza, the Smashing Pumpkins would have still been the replacement headlining act, but their music would not have filled a void (which would be nonexistent). Thus, Billy Corgan and the Pumpkins wouldn't have had the same Mellon Collie and the Infinite Sadness, top-of-the-world rock band experience from 1995 to 1996. Having dissolved Nirvana, Kurt would have written and recorded solo album after solo album in the vein of Eddie Vedder's Into the Wild, albeit more bluesy than folksy. But let us snap back to reality. After Kurt's death, Dave Grohl recorded a successful solo album, which formed a rock band that has recorded five additional studio albums. The sixth chapter of the Foo Fighters' existence, Echoes, Silence, Patience & Grace, sounds like a standard Foos album for the first four tracks. The first three tracks are dynamic and oft-angry rock songs that would find good homes in Foo Fighters, The Colour and the Shape, There Is Nothing Left to Lose, One by One, and the first disc of In Your Honor. The fourth song, "Long Road to Ruin" sounds like it was written by Dave Grohl and no other. One chord progression hints of the slightly obscure Foo Fighters album track "Oh, George." Another chord progression (and melody overlay) of "Long Road to Ruin" has a certain quality to it, which I'd like to call the "Grohl Interval." The Grohl Interval is prevalent in their second, third, and fourth albums. Listen to the softer songs of those albums, and you'll hear what I mean by the Grohl Interval. It's not necessarily a bad thing to have a signature sound, but to release a rehash of a previous album (Human Clay, Weathered...what band was that?) is ridiculous. Fortunately, the album goes beyond standard Foo fare starting with the fifth track, the aptly titled "Come Alive." I highly enjoyed the second disc - the acoustic disc - of In Your Honor, and tracks five through twelve successfully not only successfully marry acoustic Foos with loud Foos (often in the same song), but those tracks make babies that further the Foo evolution. All right, those were messy metaphors, but I hope you understand what I mean. It's always great to hear a band try something new and branch out from safe songwriting, while keeping their identity in the process. The last seven songs outweigh the first four regular Foo fare (the single "The Pretender" is naturally part of the first four) to make this album a better-than-regular listen. There are two morals to this story: (1) Changing the past will create unexpected longterm results, and (2) unless you're AC/DC, you can't get away with releasing the same album over and over. The Foo Fighters have fortunately avoided both with their new album Echoes, Silence, Patience & Grace...although millions in this Universe would have loved to hear a bluesy Kurt Cobain solo album or two. Postscript: For the rest of this week (or until next Tuesday), you can listen to Echoes, Silence, Patience & Grace, in its entirety, at AOL Music. Post-postscript: Like many other recent releases, the iTunes version of the new Foo Fighters album contains a bonus track (two if you pre-ordered the album). It must be the influence of mp3s, m4as, and similar file format albums that stopped me from typing "CD" or "compact disc" anywhere in this review. Digression. AHA - I just thought of my oh so witty blogger name!